Friday the thirteenth, a scary day to be out on a bike if your superstitious. The road to Nashville is a short 4 hour ride but again laced with tractor trailers as far as your eyes can see, but the blacktop is smooth and the weather is great. Highway 40 stretches out across the southern part of the country pretty much from North Carolina to New Mexico and we have ridden a great part of it over the past two weeks. Nashville at night is a spectacular view from Broadway, the riverfront or from any of the roof top bars/restaurants along the street. Neon signs are everywhere outlining Broadway’s music spots and eateries. Not unlike Memphis or Bourbon St but much, much more intense. 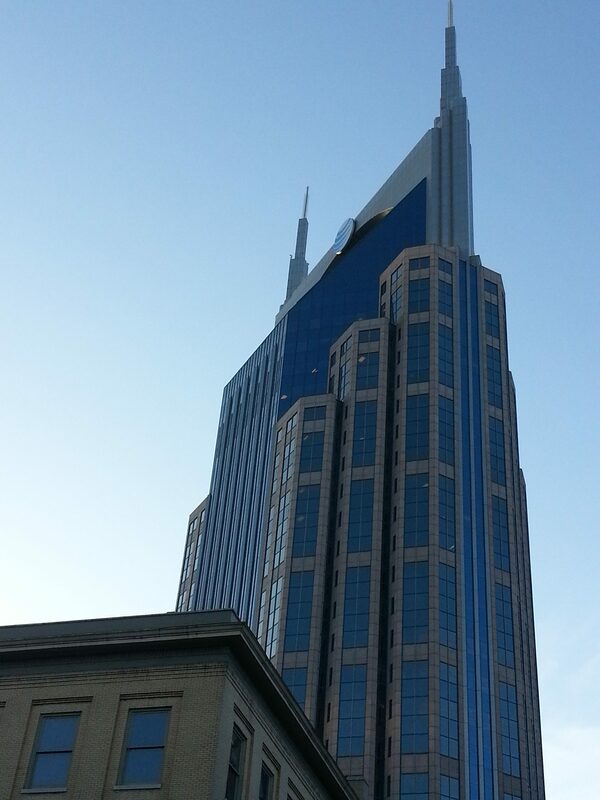 Its almost hard to hear the person next to you as you walk up and down Music City’s District area. Smokey BBQ whiffs thru the air competing only with the sounds of Country / Rock and Roll music. Streets are lined with more people than I have ever seen in a city at one time, perhaps even more than NYC during Christmas at Rockefeller Center. Museums for legends BB King and Johnny Cash, Titans stadium, boot stores, Grizzlies and Opryland are just a few of the tourists attractions for most visitors. Uber makes it extremely easy to get around town when the distance is too great to walk. 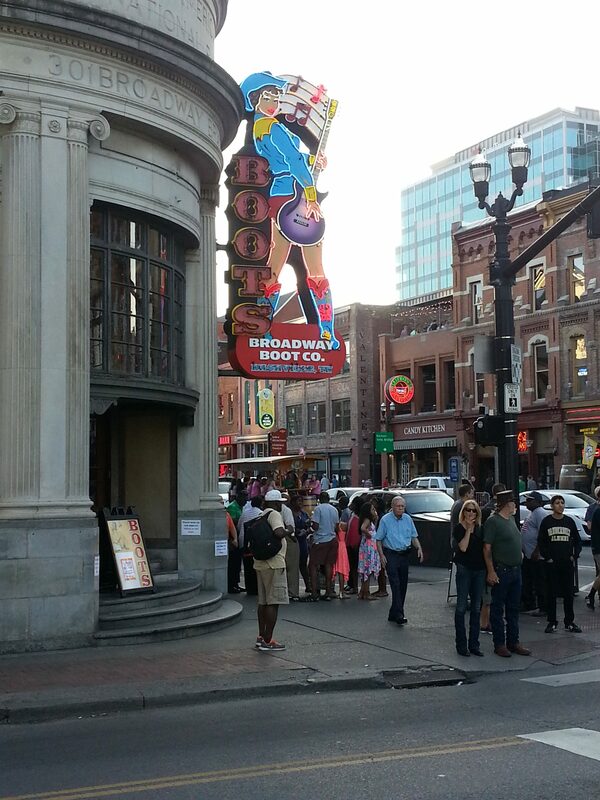 Tonight we stroll up and down each street surrounding Broadway so as to take in all the sites and sounds it has to offer.Downtown Nashville is very similar to Memphis in that music is oozing from every door and window opening on Broadway.Â Walking Broadway you see neon lighting almost every window or building with rooftop restaurants and bars filled with people.Â Nashville has its share of homeless and street entertainers just like Memphis and NOLA, working to get your money but they are somewhat passive in their efforts to attain such. Not much of a bother and somewhat interesting they approach you with all sorts of crazy things from stories to songs.Bar hopping is easy here as there aren’t any covers and you can choose to just stand outside and sample the music. Tipping buckets are the norm here for bands playing in bars. Nissan stadium where the Titans play is a short distance across the walking bridge that connects the downtown with the stadium across the river. We visited one of the music museums that featured Johnny Cash and it was worth the $18 fee. Broadway is hopping tonight with so many brides to be and their friends, who all seem to wear matching clothes, hats or something to designate they are together. This seems to be the new hot spot for bachelorette destination parties. The only thing better than getting into Dallas was getting out of Dallas. This state is huge and takes forever to get through. When I finally see that Welcome to Arkansas sign, I am relieved!! We get some rain most of the day but only drizzle that is mostly just annoying. There are tractor trailers further than my eyes can see. More trucks than cars. We constantly pass these behemoths all day long and the wind that whips around them make each pass challenging. The road to Memphis starts to turn greener and greener as we put on the miles between Texas and Tennessee. Texas is as flat as a pancake with no trees lining the highways, but a lot of open space, mostly pasture for steer and cows. As we get into Arkansas the roads begin are heavily lined with trees and clear views of mountains in the distance. Riding the main highways gets boring because the distance between towns provides nothing else to look at. You can actually find yourself daydreamingÂ but having music helps keep you awake and able to rack up the miles. Today we stretch the limit some and pile up a total of 475 miles, which is some 200 more miles that we have been averaging each day, This puts us at 9 hours on the road for the day and when we finally find our hotel, I feel a sense of relief as the heat, rain and miles in the saddle have taken its toll. I always say that the hardest part of the ride is finding the hotel because they never give you the right directions over the phone. Looking out for street signs is hard enough but when directions are poor conditions get dangerous. Being on a bike its hard to look at the road and for signs of a hotel at the same time. Road conditions inside city limits are often horrendous as is the case in Memphis. Couple that with a trolley system that has rails running all directions and its pretty scary. Those rails are buried in the ground and bike tires don’t cross them as well and as safely as a car tire does. We hit Beale street andÂ can’t help singing “Walkin in Memphis” as I marvel at all the neon and music that overloads my senses. 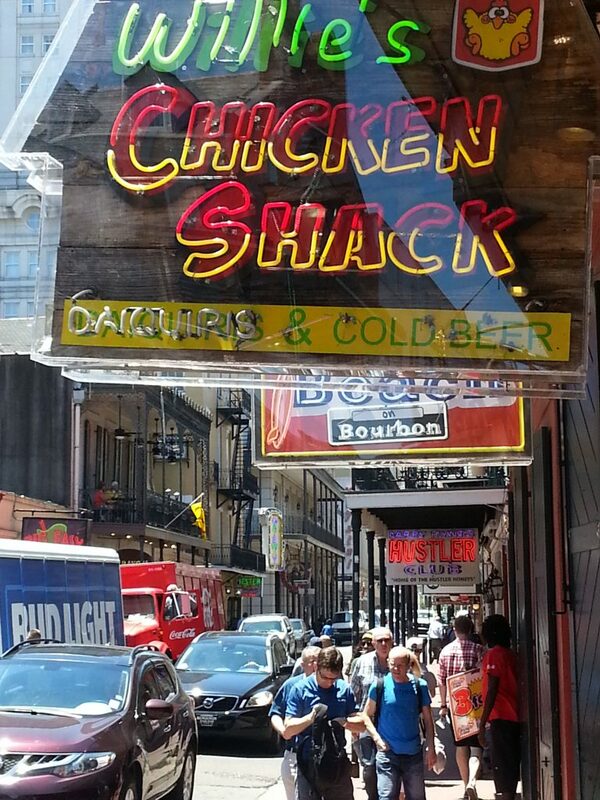 This place is amazing and it reminds me of Bourbon St in NOLA but much, much nicer. Very clean too!. The music is just pouring out of open doors at ever turn and you don’t know where to go first. 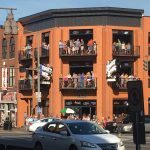 We make our way up and down the street and check out the motorcycles as it is bike night on Beale every Wednesday evening. Music from the bands and the bikes fill the air along with the enticing aroma of BBQ. Having eaten just a few hours earlier, we all decide to have a slice of pizza and stop by Pizza on Beale, a brick oven joint run by a cool dude named Cole. He hooks us up with the history of the place and how he and his wife now run the business. He makes his own slow cooked pork for his pizza’s and generously gives us a sample to try. He also does catering off premise which by the taste of the pork is probably deadly good. Stop in and say hi and tell him NJREGULARGUY sent you. Try the pulled pork or buffalo chicken pizza, and remind him he needs some hot sauce or he’ll cut you up some pepperoncini’s!!! 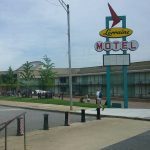 The next day we set out on a tour of the city and stop by the Peabody Hotel( to watch the ducks march),Â Â Graceland, Sun Studios, Bass Pro’s Pyramid store( amazing with fish ponds,alligators archery range and bowling alley) and the Motel Lorraine, where Dr. King was assassinated. This site gives me chills as we approach the site and I see the walkway that is so familiar to me from seeing so much of it in television and print. It made me think about the color divide we so have in this country. I know it still exists but for the everyday people in this town it seems that black or white is just fine. Being a visitor to this town you will be among a population of mostly black people who treat us wonderfully and share in our excitement of their town without any discomfort pertaining to our race. I really believe that most Americans don’t care what color our skin is as long as we respect each other as human beings. This town is incredible and everyone who lives here should be proud. Our last night in town and its time for some BBQ. We wind up at Blues City Cafe on Beale and 2nd st, where we finally get those ribs everyone here talks about. 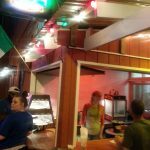 Staying away from the chain restaurants, we seek out local places where the portions are always better and the service is friendlier. 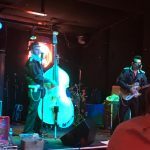 Blues City offers food, drink and entertainment with tonight’s band playing the best of Buddy Holly, Cash, Elvis and others who roamed the streets of Memphis back in the day. The food is exceptional and the music awesome, and so a fitting end to our stopover here. 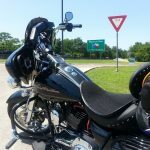 Leaving Louisiana and we stop at Cajun Harley Davidson outside Lafayette before heading out on I-10 to Texas. Today’s ride was tough. The wind and road conditions were extreme and difficult for travel on a bike. The windsÂ blowing east to west and knocking us around especially on the open roads and bridges. The roads themselves wereÂ lined with tractor trailers that filled the air with plumes of black smoke and the smell of dieselÂ fuel. We hit Texas about an hour and a half into the ride and the road turns to concrete covered withÂ cracks and tar and bumps and grooves. A lot to have to think about compared to the smooth easy roads we’ve gotten used to. The mental part of this ride is draining as we have to concentrate on the roadsÂ and trucks more than ususal. 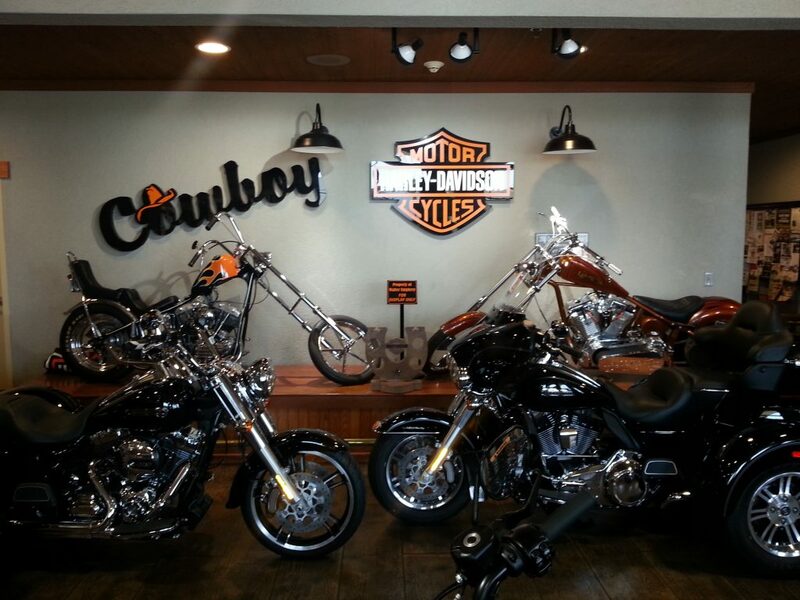 We make a second stop at Cowboy Harley Davidson in Texas. Still no shirts worth buying. We make it to Seaford Texas where we have friends and a home to stay in for the next two days. This is whereÂ we get to settle in like normal people. Room to roam, friends to hang with, hot showers and washers/dryers.Â We settle in quick then head out by CAR to a restaurant on the water where we partake in in the local seafood and Vodka! Having a designated driver is great! We eat, we drink, we smoke cigars then we go home and passÂ out. Saturday morning we wake to home made breakfast and hot coffee. In need of supplies we head out to WalmartÂ then make our way to a gun range and fire off some ammo in a friends Carbine. Texas is right up there withÂ Florida when it comes to gun laws. Everyone around has a carry permit and no one feels in danger in spite of it. They love their firearms here and there are plenty of places to buy them. Seaford area is surrounded by water with plenty of boaters and fisherman, its heaven for water recreation. Its greatÂ being with my friends and they couldn’t be more hospitable. Good news is they are moving back north this yearÂ cause they miss me so much. Well maybe not me but they are coming back. Mothers Day today and we are on the road to San Antonio after another homemade breakfast. Pancakes, French toast, sausage, coffee, I like this B and B! What a crazy laughter filled time we had here. It was a great stay over and we are sorry to leave but we need to get going. gear on. Riding in these nylon suits on hot days can be horrible but today is cool and its not a problem, although when the air gets under the suit it makes you look like the Michelin Man! We make it into San Antonio by 3pm, unpack , hit the heated Jacuzzi and pool, then shower and head into town for dinner. Steak tonight for the first time since we hit the road. I gorged on seafood for the last week every chance I got since it was all caught and served fresh from local waters. Tonight we eat like the carnivores that we are! 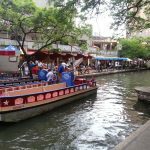 The river-walk is alive with many of the restaurants serving up families for Mothers Day, but we find our steakhouse and indulge ourselves. Walking off dinner is easy to do around the river-walk which stretches for 15-20 blocks, upper and lower levels and also at the street. We stop by the Harley store on the walk and finally get some T-shirts! 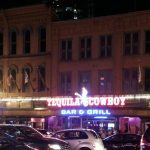 We head over to Coyote ugly for a beer and to watch the girls dance on the bar. Not so crazy a scene as its a Sunday night and pretty quiet but they do abuse you there. Better buy booze and tip or you will get an earful from the girls and they aren’t shy about letting everyone in the bar how they feel. How about Uber. Gotta love this app. They respond to requests for a ride within 5 mins. I don’t know why anyone calls cabs anymore. 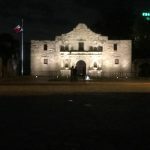 We ride by The ALAMO and grab a pic! We travel to Dallas and along the way we pass thru Austin where Jesse James has his Austin Speed shop. Well we tried for an hour to find it and then gave up. Hope we have better luck with Gas Monkey Garage in Dallas. In the hotel parking lot we meet up with three other guys who are riding cross country from LA and happen to be doing a lot of the same roads we are so we exchange stories and ideas to help each other out. Going in opposite directions so we won’t be riding with them at all but its always cool to meet up with other riders on a long trip. Dallas is dead tonight. Now I know why people say New York is the city that never sleeps. This is a ghost town and itsÂ spread out all over the place. Walk up a street and there can be a restaurant then nothing for blocks. Trolley stopsÂ running at 930p. No ice cream. I gotta have an ice cream when I go on vacation and I can’t catch a break. Last nightÂ Ben and Jerry’s was closed ’cause their A/C went down and tonight nothing. Not a ice cream shop anywhere. This is Dealy Square. JFK died here. We go to the Book Depository and take pictures, walk the grounds, ask questions and fight off the guys trying to sell souvenirs. When you see where it all happened you know that there was a cover up. Its impossible that Lee Harvey killed JFK.Â The angles don’tÂ add up to that fatal bullet coming from the building. This place looks very different when walking aroundÂ in person compared to what I have seen on television. 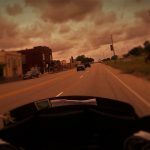 After Dealy Square We head out to Strokers Dallas, where custom bikes are built and reality shows are filmed and meet up with the owner, Rick Fearless who gives us a tour of the grounds including his office, the build shop, the machine shop and the rest of the business. He treats us like family and we talk about people we both know and the places we’ve been to on our trip. This becomes the highlight of the trip as we never expected to meet a legend and then to be treated so well after just showing up and requesting a photo with Rick. Man this was definitely cool. Later we stop at Strokers Icebox adjacent to the shop, where they have cold beers and food. We meet up with some locals who we compare notes with about motorcycles. Great end to our stay in Dallas! 1. 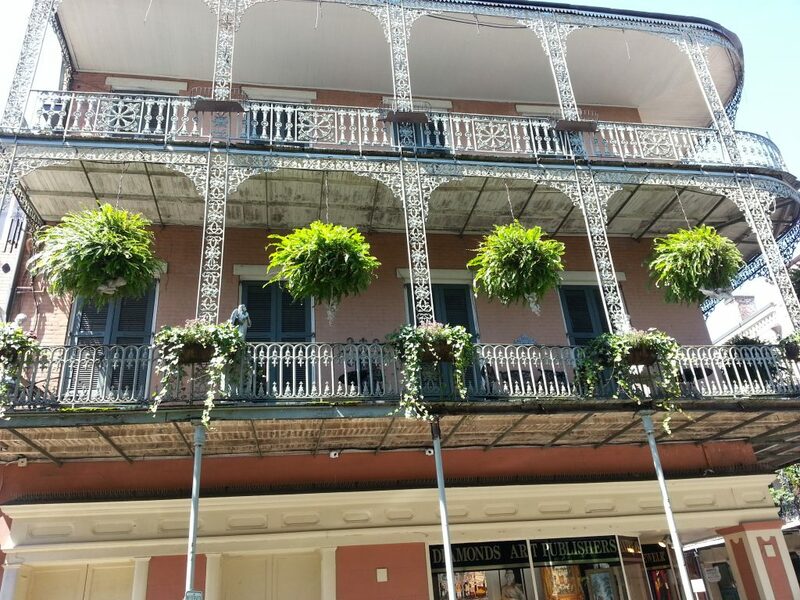 It’s stinky on Bourbon street and in the French Qtr in general. 2. Cafe du Monde makes excellent biegnets. 3. The food is phenomanal (Check out Verti Market on Royal street, you will not beleive such great tasting food a at such low prices is possible. Get the BBQ Brisket with two sides and then invite two people to share it with). 4.The Qtr is easy to navigate but scary at night off the main streets. 5. Good police presence but little interactions with the crowds. 6. There are naked women on Bourbon street. 7. There are crazies on Bourbon Street. 8. There is an ungodly amount of homeless people. 9. Still not over Katrina. 10.A must see. It’s a dirty Key West on ‘roids. Well worth the wait to visit and definitely the current highlight of our trip. It’s a lot of fun if your 3 men because you don’t have to worry too much about your safety but 3 women should be very careful. 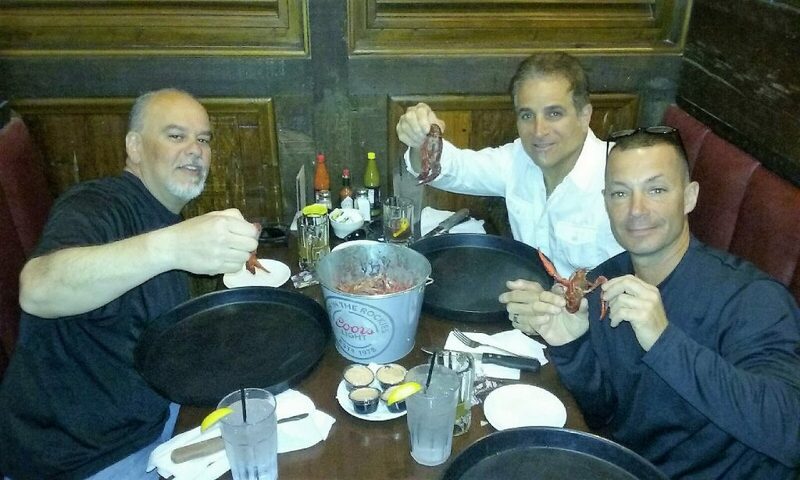 Lafayette provides us with our first experience eating Crawfish. We head over to a place named Don’s on Johnson Str and our waiter provides us an education on how to eat Crawfish. $5.97 will get you 3lbs of steamed Crawfish which in reality amounts to about 8 ozs of meat, but a very tasty 8 ozs.Beers are 2 for 1 and my Catfish and shrimp dish is all you can eat tonight. Really good food! Tomorrow we head out for Texas. This is our first day without riding to another place and its nice to be able to relax, kick back, wake up late and take in the town for a second day. The French quarter in the light is a mixed experience of the senses. The architecture is really something to see with its French influence, a lot of iron fences, cobblestone streets and old buildings. Its a great town to walk around, sight see, shop, eat and especially drink, which most people do the the extreme here. The thing that ruins this town is its disgustingly filthy. The odor in the streets is overpowering and hard to tell exactly where its coming from although its everywhere. Poverty and devastation is all around and New York has nothing on New Orleans when it comes to homeless. Its really too bad that with all the tourism and money spent that this town is in such bad condition. This town reminds me of a French Key West covered in stinky odor. Today we walked down to the Mississippi river where the walls didn’t hold the flooding back. Some homeless guy put us into a tense situation when he insisted on cleaning our shoes. Not taking no for an answer he proceeded to spray what we think was water and buffing my friends boots with a dirty towel. Then after insisting on $20 he wouldn’t give change back from a $50. After some calm but forceful words, I grabbed the $50 back from him and we eventually walked away. Not good to get into it with the homeless especially with five other guys hanging close by. Its so strange that things like this happen so close to places like the Cafe du Mond, where hundreds of people are sitting and standing while eating their famous desserts.Â Well known for its Beignets and strong coffee, its way to tempting to pass by without trying some. Food in this town is everywhere and the choices keep you wanting to try food constantly, even when not hungry. Boudin, gumbo, jambalaya, oyster bars everywhere and the shrimp from the gulf waters. I know people here drink a lot but I have a hard time not eating more than not drinking. Everywhere you go in town something strange happens. There are so many wacky and scary folks just walking around the streets that its impossible not to stumble upon something unusual.This town is so weird and more so then any other place I have ever been. How one town can make you feel both excited and scared at the same time is really obscene and a major part of the reason so many people are drawn to New Orleans. 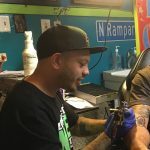 What better place then New Orleans to get a new tattoo? I can’t think of one. This road trip we are on is full of great things to see, great things to eat and drink and great reasons for getting another tattoo. On the night before we get ready to leave New Orleans, we decide to get it done. Place a lifetime mark on my skin to remind me of how great this trip has been. We ask around town for a reputable Tattoo shop and low and behold there is one a block away from our hotel and they take walk ins. We get our act together and head out to see if we can design something and bring home a souvenir. From the outside, the shop looks just like any other Tattoo Parlor with tattooed people hanging out front, motorcycle at the curb and customers poking around. Most places like this are not usually filled with friendly guys and most can be very intimadating as this one looks to be at first glance. Its always awkward going for Tattoo because you dont want to feel as if your wasting an artists time but you don’t want to make the wrong decision either. I kind of figure that most artists get alot of tire kickers and first timers trying to get the nerve up to do it. Meet James Wallace, our Tattoo artist this evening. 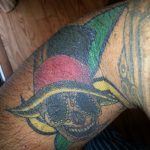 This guy just took the reins and drew up a design, asked the right questions and made us feel comfortable throughout the process which ended up in the two of us leaving with new Tattoos. For anyone who wants an experience not just a Tattoo, this is your shop. All the guys who work there were extremely friendly and even offered us the opportunity to order food delivered since we would be there through dinner. I can’t say enough good things about the staff and the work they do so I’ll just end it here with a thank you! Hows this for a white GTO? Morning breaks and we make it to Sanford Fl by 830a. Waiting for the bikes to be unloaded takes about two hours so we sit and watch for them and our third party, who has made plans to meet us here today. Its HOLY HOT outside as temperatures reach the high 80’s and so we dress accordingly. Speaking of which, today’s new fabrics for underwear work wonders when riding long distances. With our plan to ride 275 miles and in this heat, these new synthetics do the trick. Best part about them is you get in the shower with them and wash them there, hang them to dry and in the morning they are good to go. So we make the long haul only stopping once for lunch and twice for gas, but at the last stop for gas we meet some of the local residents. While pumping fuel two guys without shirts,shoes and covered with tats start fighting. Well one guy was fighting and the other was getting pummeled. Quite a scene. Funny still because as they were chasing each other and later as they fought, they ran into my friend and almost knocked his bike down. Where it got funny is as they were leaving the station, each guy came up to my friend and apologized for knocking into him!I’m guessing they didn’t want to leave us with a bad impression of the locals.Â Crazy stuff. This is what I mean by the funny things that happen on these trips. farms and flatland. Tommorow its off to Alabama and the gulf shores. After a short 25 mile ride, we load our bikes on the Fort Morgan Ferry, which will take us across a body of water to the other side of Alabama’s coast.Â As we pull up, some crazy little man in a helmet and high water jeans , tries waving us into our respective lane for entry to the ferry. He’s quickly shown his way by the attendant who then takes over the job of getting us in position to pull on to the entry ramp. We come to find out that the little man is traveling with his son on a rented HD bike. They both flew from France with a group of 20 people who somehow got ahead of them with all their luggage and money. TheÂ support team they hired to lead the group wasn’t being very supportive in guiding the group safely thru the states. 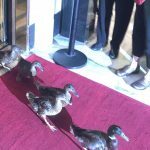 After hearing that they didn’t have any cash, I offered them gas money to help insure they make it to their next hotel. We wind up chipping in $15 to give them enough money for gas and lunch if needed and offer them a spot in our line to ride with us so to insure they get to their destination okay. Hard to understand us I guess since they don’t speak much English, but they agree to ride along with us. Funny, but that lasted about 5 minutes after we left the ferry parking lot. As I pulled in to gas up, they got nervous and thought I was going the wrong way and took off in another direction. Damn French still don’t appreciate Americans and all we do for them!!! Not even a good-bye. 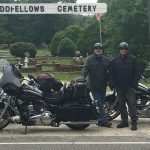 The ride today takes us through 3 states from, Alabama to Mississippi to Louisiana,Â back roads most of the way. Passing through small towns that look the same as they did 50 years ago but with no or little business. Abandoned homes and buildings line the roads for miles. Some towns have shrimp boats lined along the river banks like in the Forrest Gump movie, which happens to be one of the areas we pass through. Coming into the New Orleans area you need to cross a lake that had to be more than 2 miles across, and the span that you need to drive over is crazy big. Four lanes across, windy and full of fast moving trucks and cars that don’t care too much about bikers. I tuck into the bike and throttle it hard to get the bike to stay steady in all the wind andÂ pray that this long span will end soon. The town is full of ongoing construction and plays havoc on the bikes as we navigate thru it all looking for our hotel. By shear luck we happen upon it after driving in circles for 20 minutes. Our place is in the center of the French Quarter which makes it very easy to get around without a motor. I have been looking forward to our stopover here and I am excited about the local food scene and can’t wait to eat Cajun and Creole seafood! Our first stop Bourbon Street! Tallahassee looks better in the mirrors as we head out to Alabama’s Gulf Coast! It looks and feels like rain and the forecast says we are going to get some. I hate getting wet but we set out with hopes of making it thru most of the day without getting rain. The first 20 miles or so are highway but after that we settle in to back roads that are perfect and without any traffic. When you plan a trip like this its hard to know from looking at google and maps, just what kind of roads you will be on. You do get a sense of what type they are based on the states designation of the road. Interstate, rural, state highway to name a few, gives you an idea how fast you will get to your destination. Taking back roads are the way to go on a bike but they increase your riding by up to 2 times. Most of theÂ roadsÂ so far have been country or farmlandÂ , which plays right into the ride perfectly because they are the most fun to travel on. All the smells that range from sweet and flowery to holy horse crap! But that’s what makes riding that much better than driving. Crossing the ” Flora-Bama” state line is a big deal here. Flora-Bama is known for its Mullet toss once a year, where people come to see how far over the state line they can toss a mullet. Actually at the state line is a Flora-Bama property that has three restaurants and a nite club. On this nite we chose to eat in the Ole River Bar. Hey Eryn, I hope you read this! Eryn was our waitress and a great one at that. Extremely friendly andÂ she set us up with the Mets game broadcast right to our table. A Batman fan at heart, she gave me her check sleeve that she made herself, when she found out Batman’s my favorite character. Thanks again Eryn!